Blackberry has launched its first touchscreen-only Android handset. 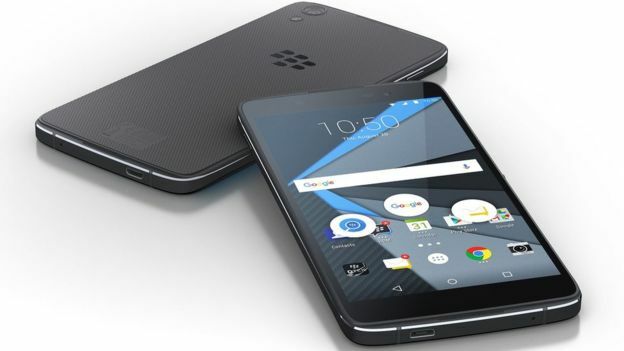 Blackberry has launched its first touchscreen-only (no keyboard) Android handset. The company says its new Dtek50 smartphone offers improved security over rival Android devices, and will cost less than its previous handset Priv (priv’s price ranges between 42-45k Pak Rs. Priv Blackberry). Dtek50 is Blackberry’s second Android handset after switching focus away from its struggling BB10 platform which faded away in competition with Iphone and Android. “The real challenge is whether Blackberry can convince enough corporate buyers to buy a batch of mid-range phones,” said Nick McQuire, analyst at CCS Insight. It is said that Dtek50 also shares the design of the Idol 4S – a handset produced by Alcatel, a Chinese-owned rival. Blackberry says the phone has unique internal hardware, with its chips protected by cryptographic keys to prevent tampering and thwart hackers. The Dtek50 has a 5.2-inch, 1080p display (424 PPI), an eight-core 1.5GHz Snapdragon 617 (four 1.5 GHz Cortex-A53s and four 1.2 GHz Cortex-A53), 3GB of RAM, 16GB of storage with an SD card, and a 2,610 mAh battery. The rear camera has a 13MP sensor with a dual-LED flash, while the front sports an 8MP sensor. The price for Dtek50 is US $299 which is very reasonable for the specs it is offering. For the loyal blackberry users, this news of new Android handset is no less then a celebration and the sales of the phone is expected to break blackberry previous models record. “The biggest challenge Blackberry faces is that it has to consistently educate customers that it’s not a dying company,” said Mr McQuire.